As we’ve pointed out in previous blog posts, hand-woven rugs are works of art and should be treated as such. These beautiful, hand-woven textiles are unique and the result of many hours of labor and generations of knowledge and skills, and it is, for this reason, they are so highly valued, both in monetary terms and for sentimental reasons. Many rugs are in areas of heavy traffic, so it is essential that they are cleaned every couple of years to preserve them. One of the most important reasons for getting your area rug hand-washed by a specialist rug company such as Oriental Rug Salon is so that a thorough dusting takes place. Rug dusting is one of the essential steps to having a clean rug. Dust, dirt, and grit gather in the carpet over time and compacts to form crystals in the foundation thereby creating an abrasive surface. These crystals, which are sand-like, can damage and even tear holes in the rug if they are left unchecked. Many rug owners believe that with frequent vacuuming, they can remove deep-set sand, soils, crystals and other contaminates that are harmful to their rugs. The truth is, vacuum cleaners do an excellent job at removing “surface soils” but are useless once particulate has embedded in the foundation of the rug. Each area rug trusted to our rug cleaning plant receives a thorough dusting by a professionally trained technician using the industry-leading Rug Badger. The Rug Badger is a device that administers over 40,000 harmonic vibrations per minute to the rug to dislodge deep-set contaminates. The Rug Badger completely separates heavy sediments and dirt from the area rug that even the best vacuum cleaners leave behind. Once we know a carpet is deposit free, it goes through an inspection process, pre-treatment and then hand washed. Unlike rug cleaning plants who use mechanical equipment to “batch wash” many rugs at a time, Oriental Rug Salon washes each textile, by hand, one at a time. Hand washing of wool and silk rugs is a labor of love and allows our professionals the opportunity to provide the best treatment for each carpet assigned for cleaning. If an area rug contains pet urine or has stains that require professional intervention, we can address its individualized needs by using the safest, most effective spotters, enzymes, or other special treatments available. If an area rug has a color run due to the inexperience of another rug cleaning company, a carpet cleaner or because of a spill or pet urine, chances are, we may be able to reverse that damage. 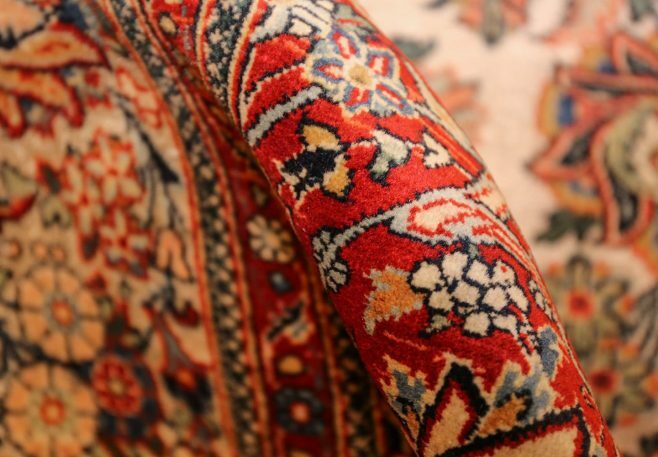 At Oriental Rug Salon we take great pride in our high levels of artistry our cleaning efforts produce. We are a trusted source for the cleaning and restoration of area rugs that are owned by rug collectors, museums, restoration companies and clients whose rugs have been in their families for generations and are priceless to them. For more information about our Oriental, Persian, Turkish, wool and silk area rugs, please visit us online at www.OrientalRugSalon.com or call us anytime at 239-424-8171 – Lee and Collier County or 941-896-1655 in Punta Gorda, Port Charlotte, and Sarasota Florida. Hand-woven wool and silk area rugs are works of art that were made with love and attention to detail. Making sure they receive an excellent hand-washing every two-three years will preserve their beauty for years to come.